PC18 from Jamma+ forum dropped me 2 UMK3 boards around a while back in the hope we could get one of them working. The first board failed its self test flagging the ROM U2 as bad, when one fails none of the others are checked and the game boots. The second board just had a feedback sound playing all the time and no game sounds were there even though all self tests pass. Checked the voltages on both boards and they were all fine. Probing around at the sound ROM’s on the first board I could see that none of the chip select lines were ever being activated. I traced this back to the protected GAL22V10 chip, fortunately I had another GAL from the second board but got the very same fault. Refusing to believe that both chips were bad and in the same way I started looking elsewhere. 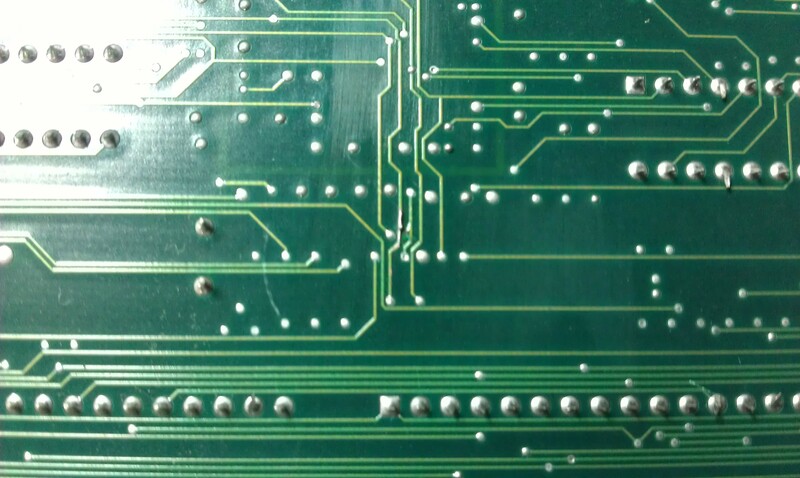 The ADSP-2105 chip is the sound processor on this board and could see that all the address and data lines were completely dead. At this point I wrote the board off and focused my attention on getting the second board running. I know that if the -5v is missing then the you will get the very noise that I was getting with this one. Only trouble is all the voltage levels were fine to all points I could trace. 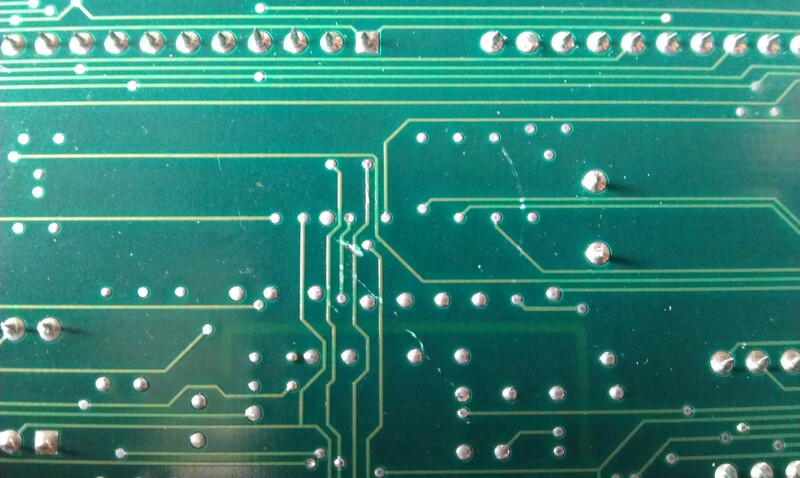 These boards have A LOT of small surface mounted capacitors and resistors which makes tracing things out a huge task and as there are no schematics available I was getting a bit frustrated. Out of frustration I decided to probe the sound processor on the board and found that on start up all the address and data lines are in fact tri-stated just like the first one so it got me thinking that the other board was maybe OK. This actual mark was tiny until I starting prodding at it and missed it on my initial inspection but there was no continuity between the 2 ends of it so it was cut all the way through. Even better news was it did go to that GAL chip so probably would affect the sound circuit. Fired the game up and was greeted with a 1 tone sound which actually means the sound hardware is OK, previously I had 2 tones which means there is a fault. Due to the reason mentioned above I’m not going to try fixing the other board up but I have confirmed that all the processors and stuff are working so there are spares should he need them.